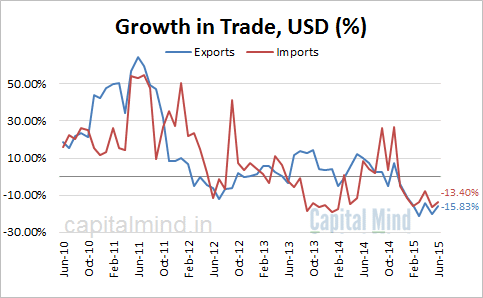 India’s trade continues to show two very distinct signals. First, that the deficit is down. Look at the merchandise trade stats for June 2015: the deficit is just $10 billion, which is about as low as it has been in the last few months. This is great for the current account, where gold has been the make-or-break for us. If you take away gold imports, we actually are a surplus on the current account! But wait. 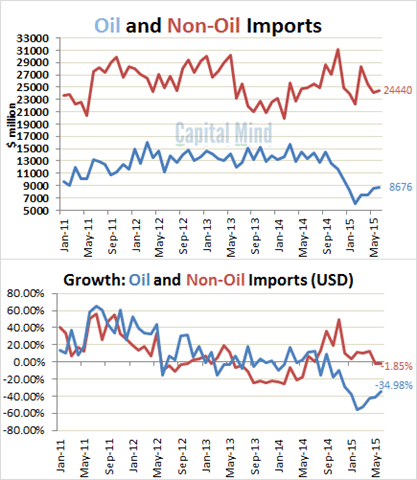 Not only have imports dropped, exports, too have fallen off a cliff. 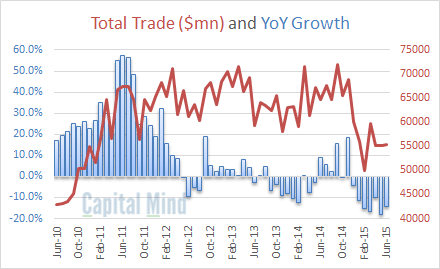 Total trade (imports plus exports) is down a huge amount, about 14% lower than last year. 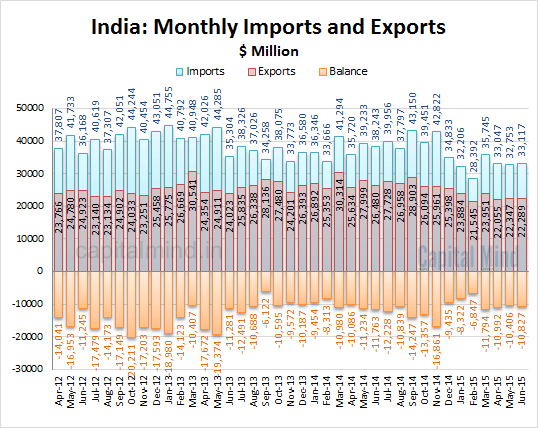 Gold imports were lower by $1.2 billion which contributed to the $500 million drop in Non-Oil imports. But that means that net of Gold, non-oil imports grew by only $700 million which is a low 1.5% growth. If this is “Make in India” working out that would be different but from any data we see, Make in India is not really working on a macro scale. It’s more indicative of a slowdown. The upside of seeing data so bad is that we can only improve from here. Apparently, markets think so too, they are now within 5% of their all time highs.